Grocery shopping is one of those tasks that many people take for granted. It is simply something that you do every week or even every few days to make sure that your family has the healthy foods that they need to thrive. For your elderly parent, however, this task might not be that simple. Mobility issues and lack of transportation can make it so that they are not able to get out of the house to handle their own grocery shopping, leaving you to either pick them up and bring them, or handle it on your own. 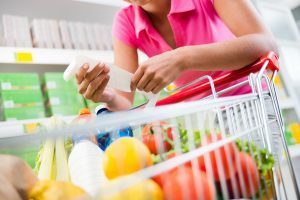 Either option can ensure that they have their groceries, but it can also reduce their sense of independence and autonomy, and leave them feeling isolated and frustrated. Relying on home care for this task can reduce this stress and make grocery shopping a valuable part of their lives again. An in-home senior care services provider can offer a wide variety of highly personalized services for your senior to help them manage their needs and maintain their quality of life. One that is particularly useful is safe and reliable transportation. This transportation allows your parent to run errands and engage in activities that they need and want to, when they need or want to. This includes grocery shopping. This means that they do not always have to rely on you or work around your schedule to stock their kitchen or get out of the house. The services of a care provider do not just include getting to the store. They can also assist your parent with the shopping itself. They can offer mobility assistance to help your parent get around, support healthy decisions regarding what foods to eat and reminders about restrictions and guidelines from their doctor, and help with picking up or carrying items. This gives your parent the ability to make decisions and feel more in control of their own lives, while getting both physical and social activity. Starting home care for your aging parent can be an exceptional way to help them live the quality of life that they desire and deserve. An in-home senior care services provider will create a care approach specifically tailored to your parent’s individual needs, challenges, and limitations, but also with their personality, lifestyle, and goals in mind. This means that they will be able to stay healthy, happy, safe, and comfortable, while also pursuing greater independence and fulfillment as they age in place. These services can include safe and reliable transportation to ensure that your parent can get where they need and want to go on their own schedule, mobility support, assistance with personal care needs, help caring for their home, medication reminders to keep them compliant with their prescriptions and guidelines, and companionship to support high mental and emotional health. If you or an aging loved one are considering home care in Matawan, NJ, please contact the caring staff at Lares Home Care 888-492-3538 or 732-566-1112.